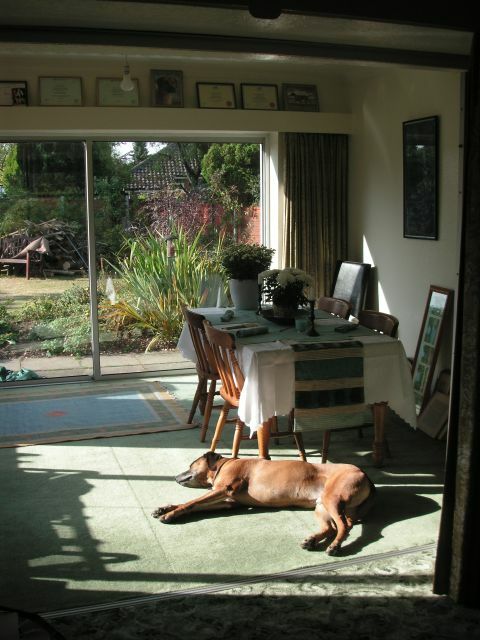 We’ve changed all the locks, secured all the windows and generally battened down the hatches since we moved in and all is secure but you can’t beat a 4-pawed 24-7 patrolling security system such as a Rhodesian Ridgeback. Louis is constantly on guard…..
To be honest I’m being unfair. Louis is the best perimeter control system I have ever seen. The unwritten deal between hound and human is that the hound makes sure that he looks after border control – Louis sees this as a perk of the job! Hi thanks for such interesting posts. Our 9mth old boy Dexter is nothing like Louis except for the appetite thing, our boy would let anyone in the house on the off chance they fed him. He’s an absolutely beautiful boy even tho he is a poo eater, bed chewer, clothesline ripper downer and is allergic to dry dog food. He is about 45 kg but we were thinking he would be taller, how tall is Louis? Hello Lou, thanks for dropping by and leaving a comment. Louis is 27.5″ to his withers which is just a little bit above the range in the breed standard although when we showed Louis there were always many dogs much bigger than him. He’s settled at around 45kg now but was around 40kg at 9 months so Dexter should end up a little taller than Louis. Louis also has a thing about helping with the washing as well; whilst Dexter helps getting the line down, Louis’ contribution is to attack the washing bag as you take washing out to dry or bring it in. We’ve been very lucky on the chewing side of things though; a few bits and pieces got chewed when he was a pup and teething but that was it.